In Canvas you can add contact methods to receive notifications. Contact methods allow you to select how you want to be notified when various events occur within a course. 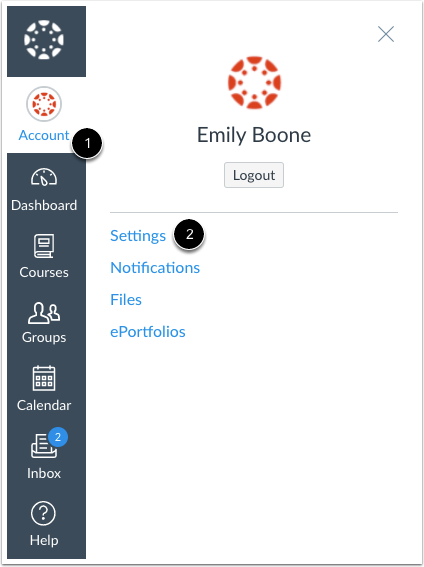 Notifications are applied to all courses in Canvas. 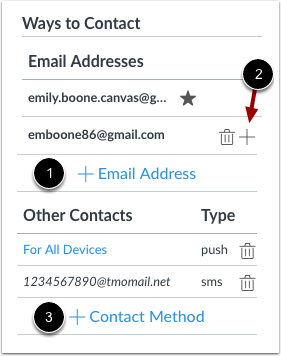 Canvas supports notification through email, SMS text message, and Twitter. Once you add contact methods, you can set your own Notification Preferences to select how often you want to be notified of course events. View a video about Notification Preferences. In the Ways to Contact sidebar, your account displays the default email associated with your account, if any. However, if you want to add an additional email address, click the Add Email Address link . 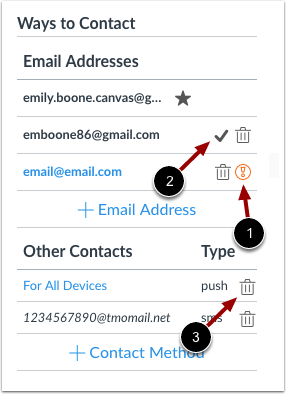 If you have multiple Canvas accounts, you can view the Add icon , which allows you to merge the address with another Canvas account that uses the same email address. If you want to add SMS text messages as a contact method, click the Add Contact Method link . Canvas does not send notifications to communication channels that have bounced, which means the channel can no longer attempt to generate or send a notification. Bounces can occur from invalid addresses (caused by address typos, changed addresses, etc.) or blocked servers. Warning : indicates a bounced contact method. To correct the error, you can remove then re-add the contact method to your profile. Check Mark : notifies you of an unconfirmed email address. To delete a contact method, click the Delete icon . The Web Services portion on your settings page is divided into two columns. Services you have already registered, such as through the Ways to Contact section of your settings, or through course Collaborations and assignments, appear in the left column under the Registered Services heading . Other services that are available for registration appear in the right column under the Other Services heading . Learn how to add web services in Canvas. When you allow third-party integrations to access your account, the Approved Integrations section will appear and display the authorized integrations. Each integration will show you the name of the app, the purpose (if one is noted), the date the app was last used, the date the app expires, and a link to view further details. Previous Topic:How do I change my login password as a student? Next Topic:How do I merge my user account with an account using the same email address as a student? Table of Contents > Profile and User Settings > How do I add contact methods to receive Canvas notifications as a student? Re: how do i get emails from canvas to stop going to my clutter/junk inbox? Re: Can a teacher view a student's "Other ways to contact"?